There are four main points Peik Bech-Andersen summarizes that show how NAV delivers increased agility. They are highlighted through the detailed examples in his book. There is often the common confusion that more complexity is better. This is not true. The intuitive nature of NAV’s graphical user interface (GUI) combined with a user role-centric design creates complete visibility via a simple user experience. From granular to broad information scopes you can gain transparency through your entire production process. NAV is able to interface smoothly with other systems, as well as with networking solutions between multiple computers. This is the age where machines, as well as humans, are talking to each other. Dynamics NAV is open to integration through Microsoft Message Queue, text file import and export, and ODBC. 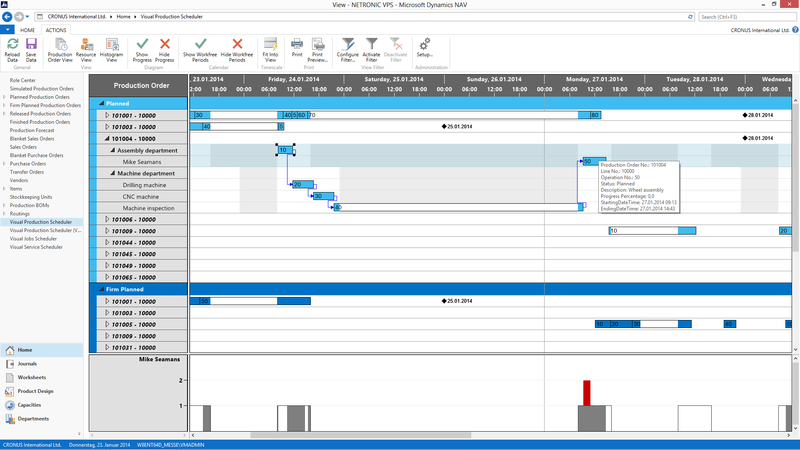 To further reiterate this point of agile manufacturing we have introduced fully integrated visual scheduling capabilities into the already powerful Microsoft Dynamics NAV manufacturung module. Using our intuitive Visual Production Scheduler add-in for NAV your production schedule will be beautifully represented using powerful Gantt Chart technology. Our interactive add-in solutions let you make drag and drop changes throughout production, view and resolve real-time load capacities, customize and print real-time schedules showing your entire production all of which you can then save back into NAV. And the best part is that this will all happen within your standard NAV environment! So I hope this short synopsis of Manufacturing in Microsoft Dynamics NAV has helped you gain an understanding of the tremendous benefit this user guide will bring to your manufacturing in NAV. This blog post is based on a book which itself is based on over 40 years of NAV manufacturing experience. This book and author have bridged the gap between the timeless value of experience and cutting edge technology. 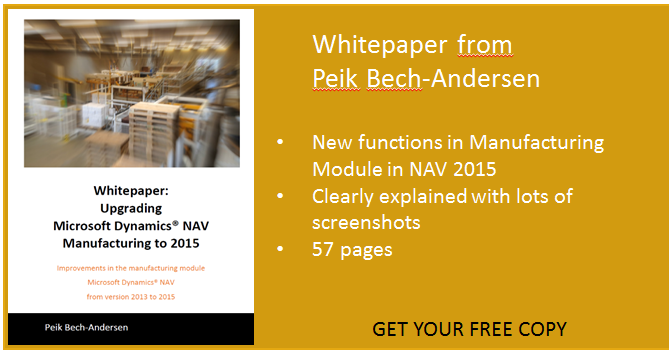 Now you can receive your own copy of Beck-Andersen's whitepaper, Manufacturing with Microsoft Dynamics NAV, along with a demo of our Visual Production Scheduler to show you how your production could immediately benefit!